If you think that a Disney cruise is just for kids, you're in for a surprise. 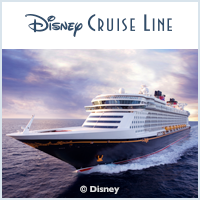 Disney Cruise Line® has designed adult only activities and venues for the "young at heart" travelers. You can begin your day with a leisurely stroll to the Cove Cafe which caters to guests 18 and older. Here you can enjoy a specialty latte in the upscale coffeehouse atmosphere. During the day, the adult-only pool is the perfect spot to soak up the sun or relax in one of the whirlpools. If you want to be pampered or if you like to work out while on vacation, head to the Senses Spa. At night, the adult entertainment district gives you a variety of options to choose from. If your cruise includes a visit to Disney's private island, Castaway Cay, you can head to the adult only beach. Home to 3 nightclubs and lounges, including a piano bar and an Irish pub. The adjoining area is decorated to look like a modern metropolis with the colors of the ever-changing sea. Home to 3 nightclubs and lounges, including a neighborhood English pub and a piano bar. The adjoining area is decorated to look like a modern metropolis with the colors of the ever-changing sea. Home to 5 lounges and nightclubs, inlcuding a champagne bar and a bar with an ever changing skyline. Each venue has a unique look, sound and feel, providing adults a range of fun options that play to all senses. Home to a variety of sophisticated lounges and nightclubs, themed to the Ireland, Italy, France and more. From the whimsical to the cosmopolitan, each venue in Europa is distinctly inspired by the very best in European travel. Alcoholic beverages and sodas offered for additional fee at onboard bars and lounges. Tranquility, pampering and relaxation in an ocean-view sanctuary providing therapeutic and personal care services for men and women. This immaculate setting offers spa treatments, massages, body wraps, facials, aromatherapy, manicures, pedicures, hairstyling and blowouts, plus teeth whitening at the Smile Spa, and a barber shop for traditional men's grooming services. Experience pure tranquility and inner contentment in an environment designed to soothe the senses. Guests' bodies and spirits are nurtured in the spa's 17 private treatment rooms and 2 private luxury Villas. Guests who have booked a treatment are welcome to linger in the Relax Room, as well as enjoy the rainforest-themed aromatherapy steam room. Specialized areas within the Rainforest room include a Hamam (steam bath), a Caldarium (steam room) and Laconium (dry sauna). Guests of the Senses Spa & Salon must be 18 years of age and older.